Along with all of their fully customizable products, Pic the Gift now offers the ability to design your own custom cuff bracelet. Pic the Gift now gives customers the power to design their own stunning custom bracelet. Pic the Gift is proud to announce one of their newest products, perfect for those who want to create a one of a kind piece of jewelry. Pic the Gift now gives customers the power to design their own stunning custom bracelet. 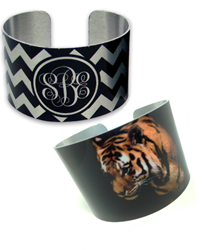 The unique cuff bracelet is made out of high quality Aluminum and allows customers to show off their favorite designs with a beautiful photo finish. Choose from either white or silver Aluminum before using Pic the Gift's online designer to add your special touch. The white finish delivers a clear, crisp photo finish to really make the design stand out, while the silver finish is perfect for black and white photos because it adds a vintage, antique look. These cuffs are great presents for moms, daughters, best friends, and family. Go all out with patterns, monograms, and images to truly create a one of a kind piece. Then to finish the bracelet, add special effects or borders. Worried about size? The durable Aluminum allows for slight adjustments to help fit any wrist. Located in St. Louis, Missouri, Pic the Gift was established due to rising demand for photo gifts and customized products. Their central location allows them to offer expedited delivery to their clients, shipping items anywhere in the United States within 4 days. Pic the Gift prides themselves on having high quality standards and 100 percent of their manufacturing is done in the United States. For more information on the cuff bracelet or any of Pic the Gift's custom products, visit http://www.picthegift.com.